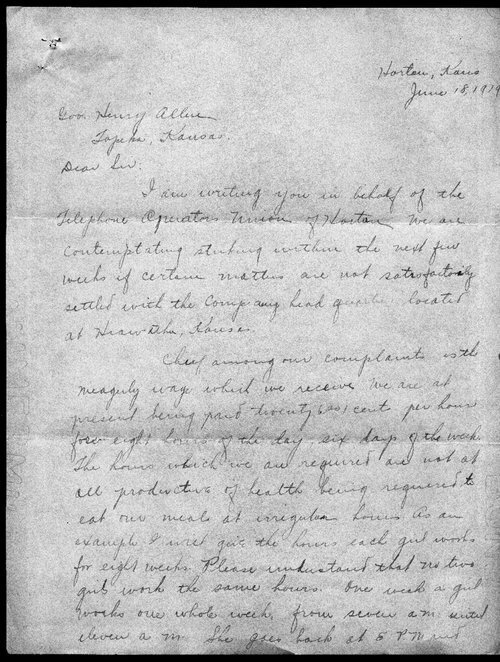 Ethel Franklin of the Telephone Operators Union at Horton, Kansas, writes to Kansas Governor Henry Allen of Topeka informing him of the telephone operators plan to strike if certain matters are not settled including wages, disruptive and irregular work schedules, and lack of overtime pay. She asked the governor his advice on seeking overtime pay for Sundays and holidays. Call Number: Governor's Office, Allen, Corrrespondence, Box 13, Folder Labor Commission April 4 - June 30, 1919.